Wedding Photography at The Liverpool Metropolitan Cathedral. Built between 1962 and 1967 Liverpool Metropolitan Cathedral is part of Liverpool’s beautiful skyline and officially known as Metropolitan Cathedral of Christ the King and located in the heart of Liverpool. It is the largest Catholic Cathedral in England and together with its sister Cathedral on Hope Street, holds an important part in the City of Liverpool. 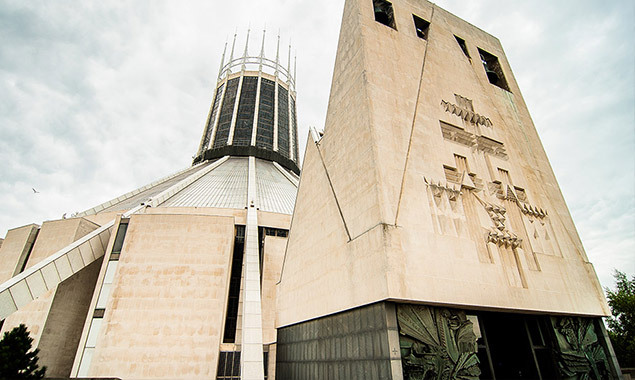 The Grade II listed building, has a circular and modern design and is known to locals as “Catholic Cathedral” or nicknamed “Paddy’s Wigwam” or “The Mersey Funnel” due to its magnificent round structure. The Archbishop of Liverpool is the spiritual Northern Province leader of the Catholic Church in England and the Cathedral is the mother church of the Roman Catholic Diocese. Underneath the Cathedral is the Crypt. A beautiful attraction that was built upon Lutyens crypt and plays host to Liverpool’s Beer Festivals. It is also a great venue for your wedding ceremony. In 2009 the Crypt underwent a £3million refurbishment, which now holds new east and west approaches.